On March 30th, President Reagan was shot and gravely wounded by a lone gunman, John Hinckley Jr. President Reagan recovered fully, but his press secretary, Jim Brady, who was wounded in the head, died from complications from his injuries in 2014. Hinckley was committed to a mental institution allowed to leave in 2017. President Reagan gave a speech at the Washington Hilton Hotel to the AFL Cio on March 28th, 1981. The President was not wearing a bullet proof vest since he was only going to be outside for a very short distance between the hotel door and his limousine. At 2:27 PM Reagan exited the hotel and headed through the “Presidents” walk to his limo. Waiting with reporters outside was John Hinckley Jr. Hinckley had come to shoot the President to impress actress Jodie Foster who Hinckley was obsessed with. As Reagan passed Hinckley, Hinckley fired six times from his Rohm RG-14. He missed Reagan with five of the six bullets. 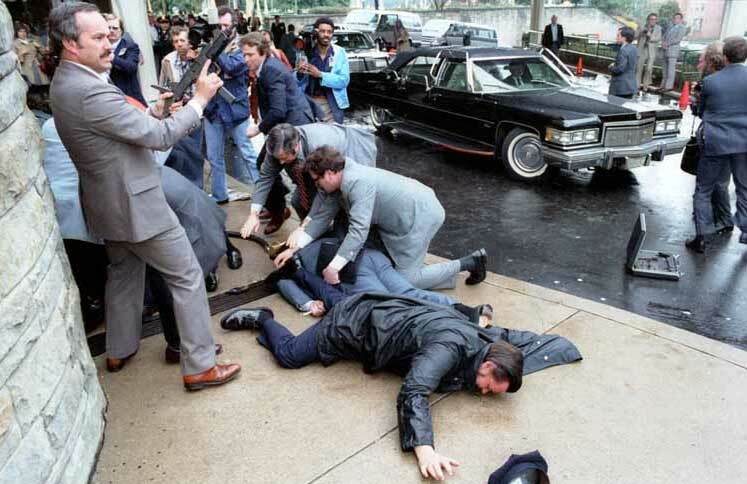 Secret Service Agent Tim McCarthy put himself between the gun and Reagan, while the agent in charge Jerry Parr pushed the President into the limousine. One bullet ricochets off the car and hit the President. The first bullet had hit Press Secretary James Brady in the head and the second had hit DC policeman Thomas Delahanty in the neck. Four minutes later the President was brought to George Washington University Hospital. There, after receiving emergency treatment to stabilize him, he underwent surgery to remove the bullet. Reagan had come close to death, but prompt action in the Emergency Room had saved his life. John Hinckley was found not guilty by reason of insanity. He was hospitalized until 2016 when he was allowed to leave the hospital to live with his mother. James Brady was permanently disabled by the gunshot wound and died in 2014 from complications from the shooting.